When I found out that I would have to spend two weeks in Philadelphia for work, I wasn’t sure what to expect. I was in Philadelphia in middle school to check out the classics like the Liberty Bell and Independence Hall, but I honestly didn’t know much about the city beyond the tourist stuff. My first inciling as to what a treat I was in for was how excited people who previously lived in Philly got when I told them I was headed there. They had lists of restaurants I needed to check out, ice cream I needed to eat and places to go to grab a drink. And these are people who are well-versed in the San Francisco foodie scene. So I ate my heart out for two weeks in Philly. All in the name of research, you know? So I could pass all of my recommendations and favorites on to you. 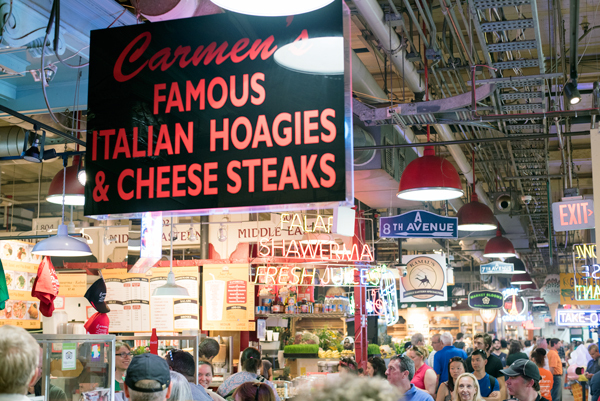 I hope you make it to Philadelphia to check out some of these amazing places to eat. By no means is this an exhaustive guide. This is the selection of restaurants that I enjoyed the most over the two weeks I spend in Philly. There are so many that were recommended to me that I just didn’t have time to check out. 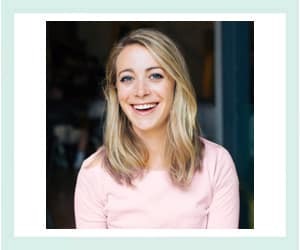 If you have a place that you think deserves to be on this list, let me, and everyone else, know in the comments! I think the best piece of advice I can give you if you’re traveling and exploring the food scene in a city is to ask the restaurant staff for recommendations. At every place I went to on this list, I started with the question, “What dishes on the menu are you really excited about right now?” Trust me, their recommendations didn’t disappoint! Zahav was truly wonderful. It’s Israeli food, done exceptionally well. 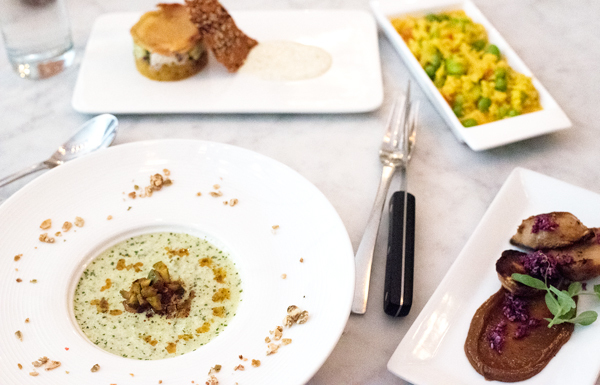 The best way to experience the food is with the tasting menu. It’s surprisingly affordable at only $45 and includes a smorgasbord of food. 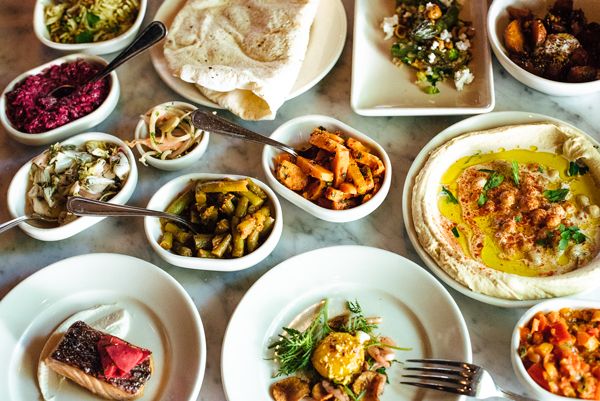 You get salatim (fresh, flavorful Israeli salads) with (incredible) hummus & laffa to start. Next, the choose your own adventure portion of the meal begins. You get two small mezze plates and one al ha’esh (grilled over coals) main. 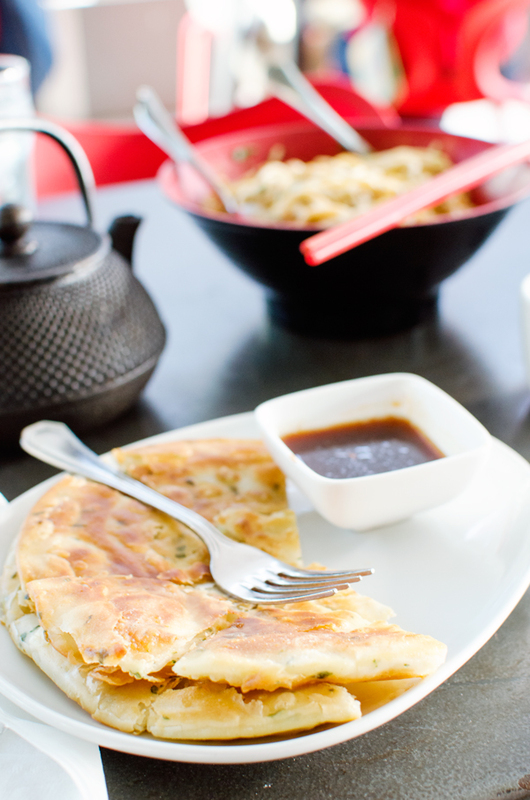 The food is fresh, flavorful and perfect for sharing with a group of friends. I had to make friends with the people sitting next to me and practically force them to help me eat it. I still had enough leftover to turn it into lunch the next day! 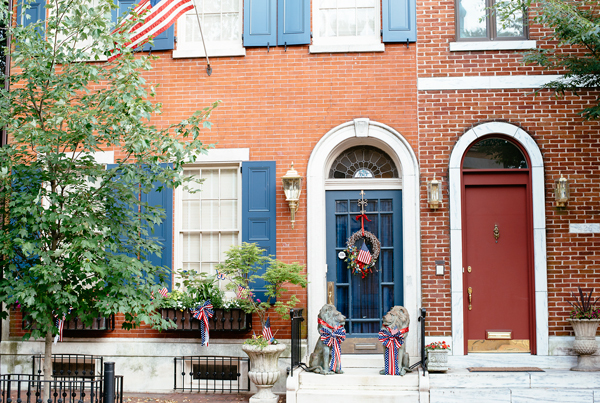 This is another Philadelphia gem. Vernick does an excellent job with farm-to-table cuisine. Every dish is innovative an unexpected – and delicious! San Francisco has gotten a lot of press about the $4 toast, but Vernick has definitely one-upped us and offers $18 toast – topped with beef tartar! There are other options that change with the season, like homemade ricotta and ramps when I went in the spring. Well played, Vernick, well played. Another dish that completely blew my mind was the Sea Urchin scrambled eggs. 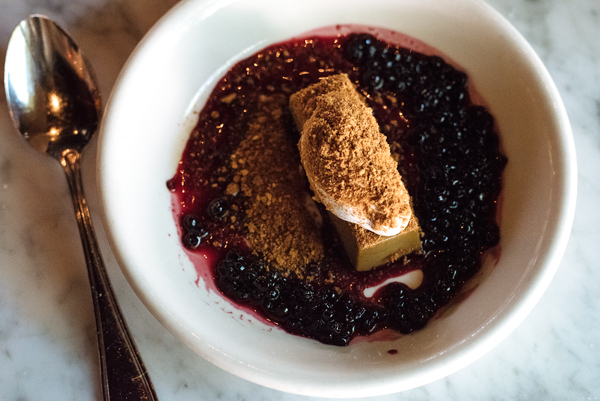 It’s a warm, custardy/foamy dish that’s basically impossible to describe but that you have to try. It’s crazy good. I tried to convince the manager that they should open another location in San Francisco. My favorite lunch spot in Philadelphia was easily V Street. 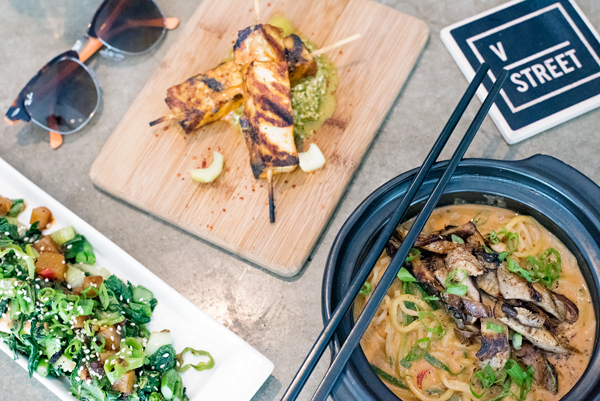 It’s the sister restaurant, of Vedge, and also focuses on gorgeous vegan and vegetarian food. It’s more casual than Vedge and has a street food vibe. On the list to try – the dan dan noodles (incredible!) and the piri piri tofu. 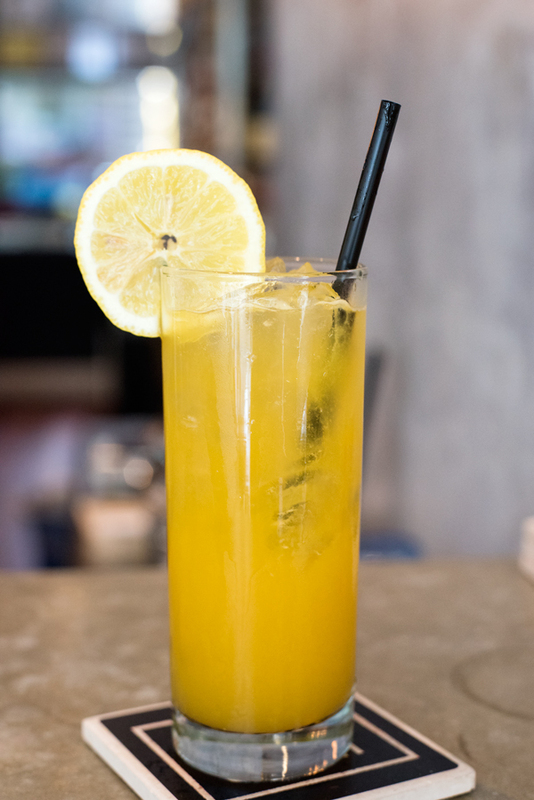 They also have a lemonade of the day (the one I tried had added lime and orange juice – so good!) as well as an iced tea of the day. As if that isn’t enough, they have fun softserve ice cream for dessert – like Cuban Coffee with guava bar chunks and mint cajeta. Han Dynasty features Szechuan (Sichuan) . People rave about the dan dan noodles, which were great, but I really liked the spicy cucumbers and the scallion pancake. The pancake is super flaky and greasy – in the best way. The service is wonderful and they also have a great selection of cocktails. 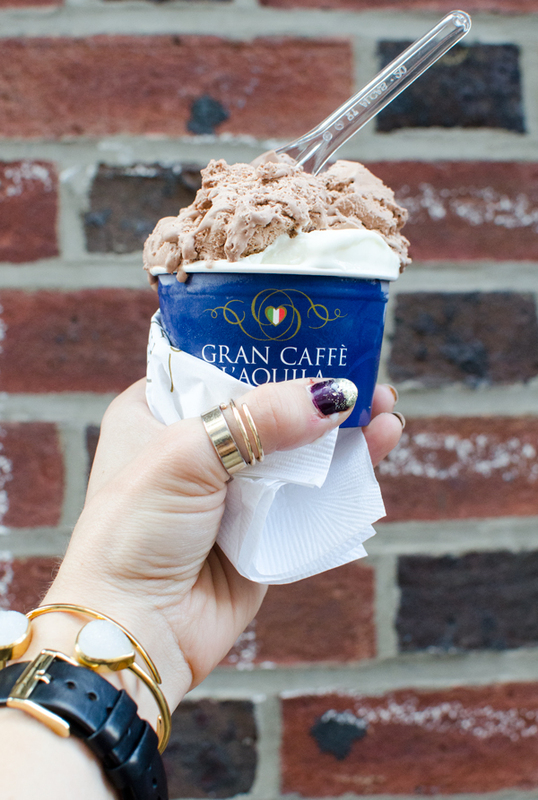 Gran Caffee L’Aquila in Rittenhouse Square offers an extensive menu with everything from light salads to pasta, but the real reason to come here is the gelato. 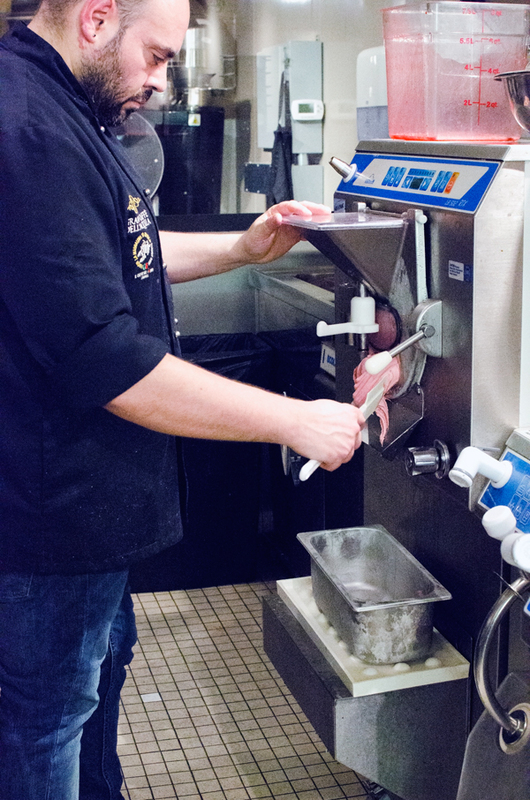 Stefano Biasini, the gelato master, won The World Cup of Gelato. And he’s in Philadelphia, Pennsylvania – how crazy is that? After an earthquake ravaged the cafe’s original location in L’Aquila, Italy, Stefano and Michele Morelli, its chef, picked everything up and moved here. It’s truly Italy’s loss and Philadelphia’s gain. Make sure you check upstairs to see if Stefano is making gelato. Vedge is the other, fancier, half of Rich Landau’s pair of Philadelphia restaurants. You already read about how much I love V Street for dinner above. Vedge is also vegetarian/vegan done in an inventive way that doesn’t require meat. It’s innovative and thoughtful and I’m surprised we don’t have something like it in San Francisco. I love that part of the menu is a ‘Dirt List’ of scrumptious root vegetables. It’s very classy and is the perfect place to impress a date or celebrate an occasion. Unless you want to sit at the bar like I did (which was great! ), you should definitely make a reservation. Tria is the best. It’s a wine bar with an incredible menu of small plates that I want to eat over and over again. 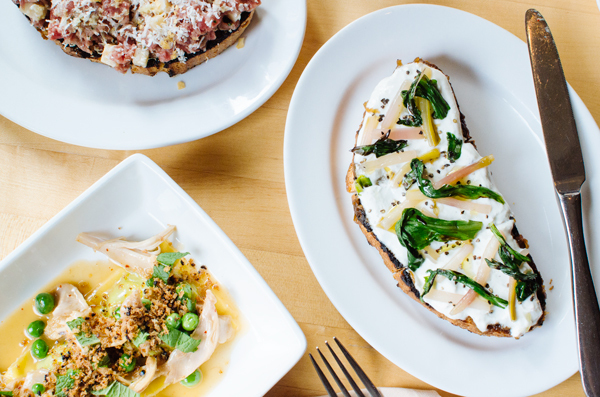 They are famous for their truffled egg toast and all of their bruschetta, but especially the pistachio herbed ricotta with lavender honey. I think that everyone I talked to about Phildelphia mentioned Tria. 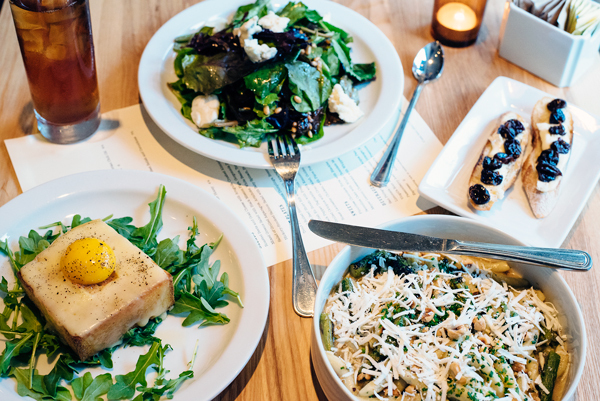 It’s perfect to visit with friends so you can share many of the small plates available on the menu. Or if you’re me, go along and eat it all by yourself. They also have several locations, mostly around Rittenhouse Square. This brings us to the donut portion of today’s post. Basically, there is a serious donut (doughnut?) battle going on in San Francisco. There are two camps. 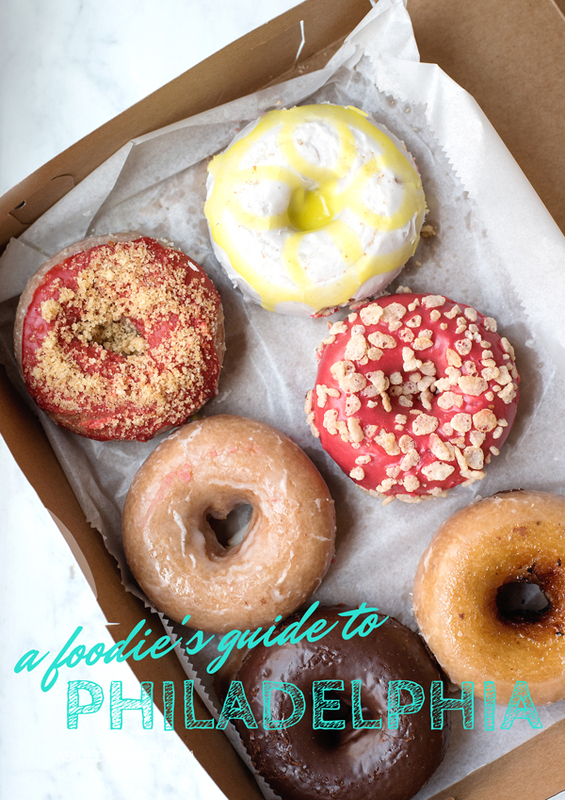 The first is Federal Donuts, which is actually owned by the same people as Zahav, which is my favorite restaurant in Philadelphia and you can read about above. 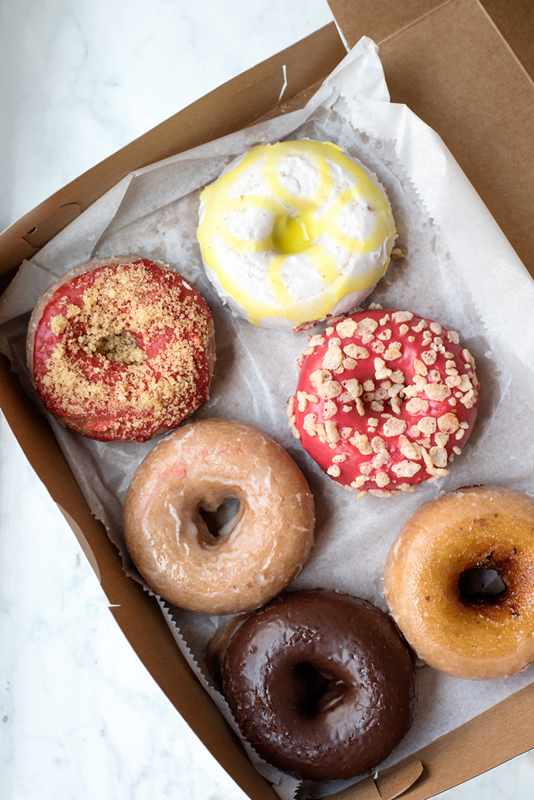 The donuts are available in a variety of fancy flavors, and run $2 each. They are all cake donuts and the batter contains a special Middle Eastern spice mix called baharat. 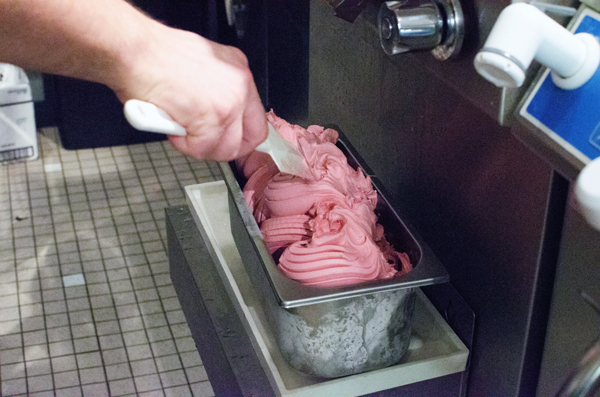 Flavors range from Strawberry Lavender to Grapefruit Brûlée. Also available at Federal Donuts is Korean fried chicken. I have no idea what that is, but people apparently go crazy for it. In my opinion, these donuts are a bit greasy for my taste, but I suggest you try them for yourself! 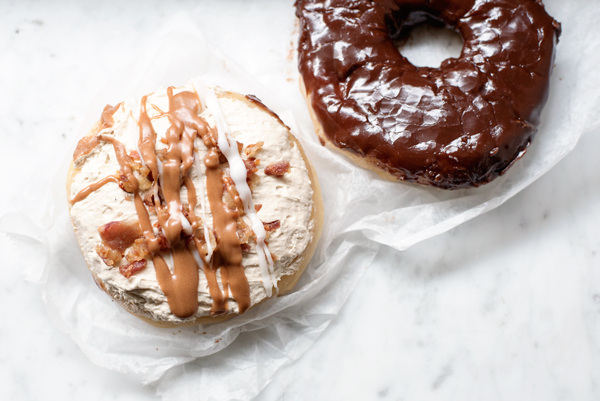 In order to make an informed decision about the best doughnuts in Philadelphia, you also need to try…. ….the donuts at Reading Terminal Market. They are handmade by Beiler’s, which is a Pennsylvania Dutch bakery stand in the market. They are soft and so good! They have all sorts of ‘fun’ flavors, like maple bacon, oreo cookie, etc. They are all about a buck a piece and there is always a line, but it moves fast. 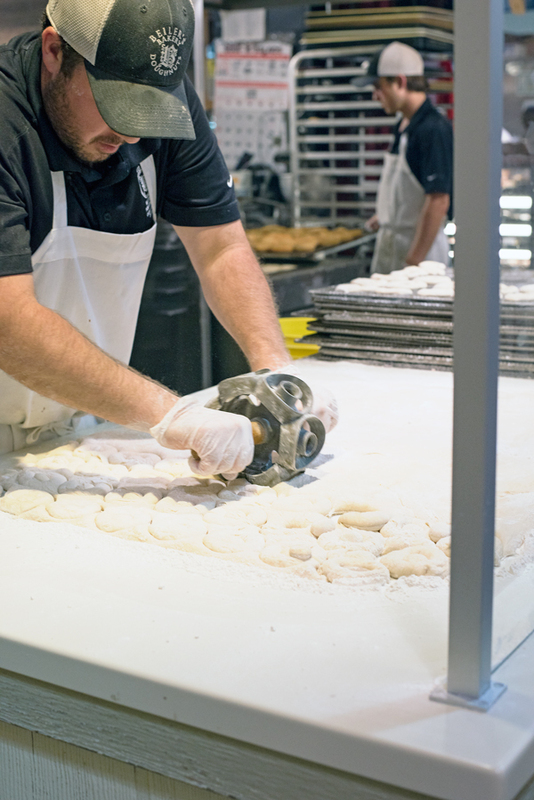 You can also watch the doughnuts being prepared, which is super interesting! I need one of those doughnut cutting out tools – genius! For me, these are superior to the Federal Donuts, but like I said, people will fight me for this. This place is so fun! Big Gay Ice Cream started in New York and just opened in Philly. They specialize in incredible soft serve ice cream cones decked out with fun accoutrements. 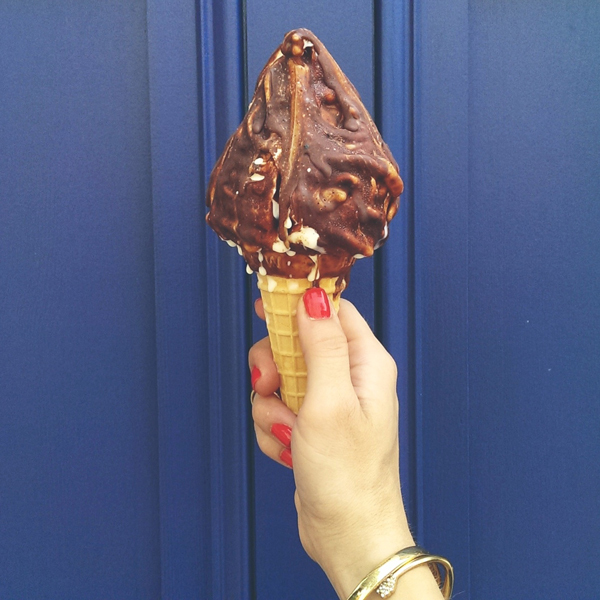 Perhaps their most famous option is the Salty Pimp – vanilla softserve sprinkled with sea salt and drizzled with dulce de leche – and then dipped in chocolate. It’s ridiculous. 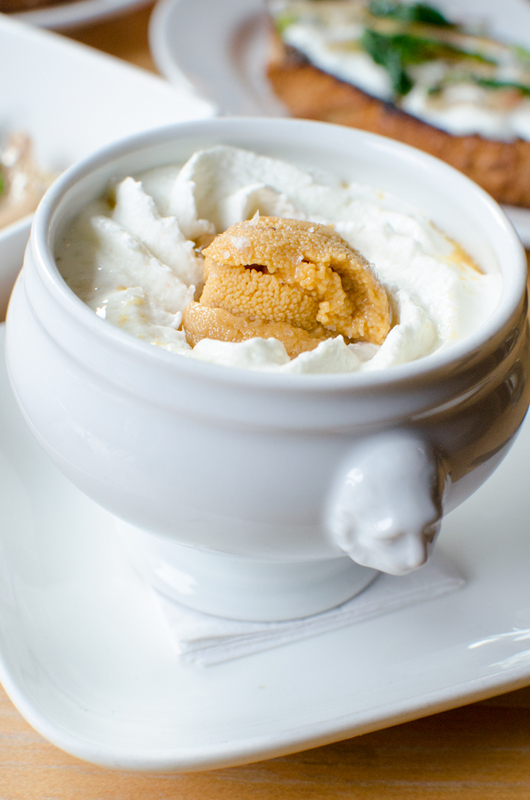 If you want to get into making crazy ice cream at home, they just released a cookbook! 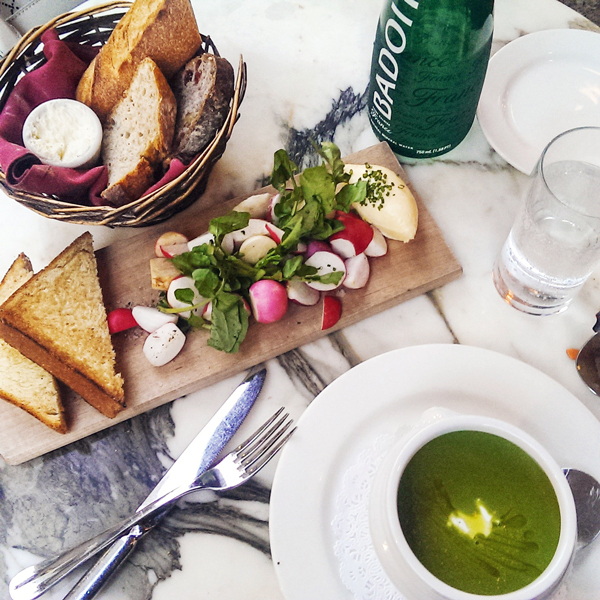 Parc is this darling french bistro right on Rittenhouse Square that is packed every night. There is outdoor seating and it’s so much fun to sit and people watch. The food was great. I kept it light and just had asparagus soup and salted radishes, but even these simple dishes were well done. And the bread basket is to die for! Sabrina’s Cafe is the place for brunch in Philadelphia. In San Francisco, we stand in line for everything. The joke is, ‘if there is a line, don’t ask questions, just get in it’. This is the place that people stand in line for in Philadelphia. There are locations scattered all over the city. 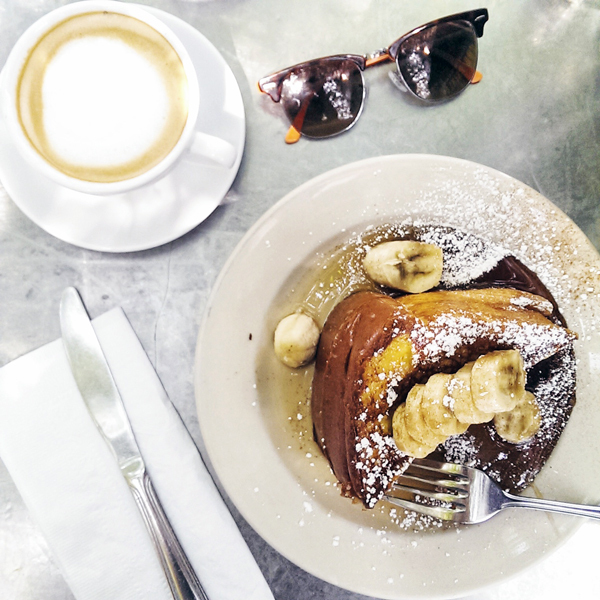 They are most famous for their Challah Stuffed French Toast. It’s crazy good and the half order was more than enough for me to fill up on. I got coffee and the french toast for $11! I’m sure this is the exception, not the rule, but I just wanted to share this super awkward exchange I had with my waitress while eating by myself. I feel like we struggled to build any kind of rapport throughout my meal, but then she finished it with this gem while handing me my bill, “Sometimes I like to have lunch alone. It’s more relaxing, you can enjoy the food more.” Note, she said this without knowing anything else about my situation, even if I was from Philadelphia or not! Gosh, everything looks delicious! Makes me just want to fly to Philly for food. And please ask the owner from Vernick again to open in San Fran! Thanks for sharing your experience! Everything looks so delicious! Great pictures, too!